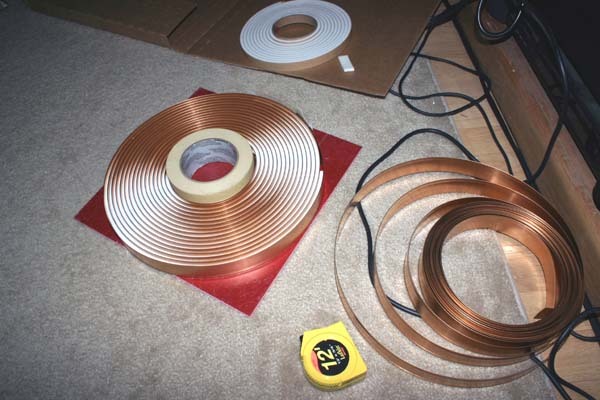 A fast and effective primary coil can be made with spring-bronze weatherstrip and polyethylene foam tape. According to WinTesla, I only need 37.3 feet of spring (3.14 feet less of poly-foam). 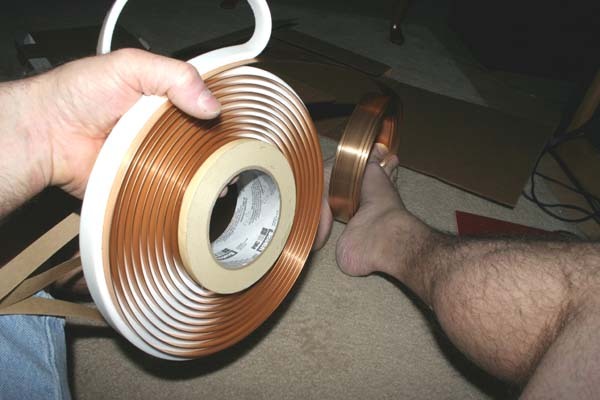 100 feet of 1.25" spring-bronze weatherstrip and 50 feet of 0.25" x 0.75" polyethylene foam strip tape for spacing. 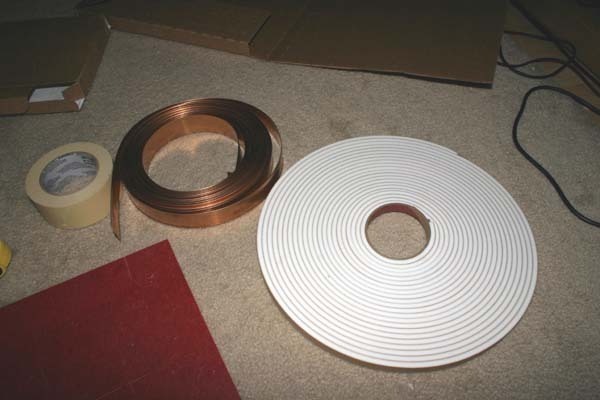 The masking tape roll is just the right size for the inside diameter and will be used to wind on. This is best done with 6 hands, but I wanted to see if I could do it by myself. 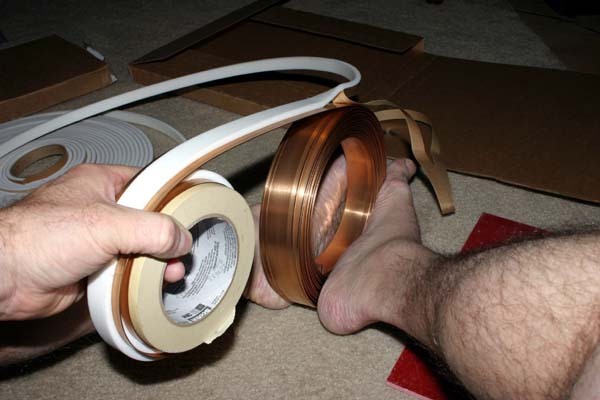 Feet hold and unroll the spring. Foam on the floor. 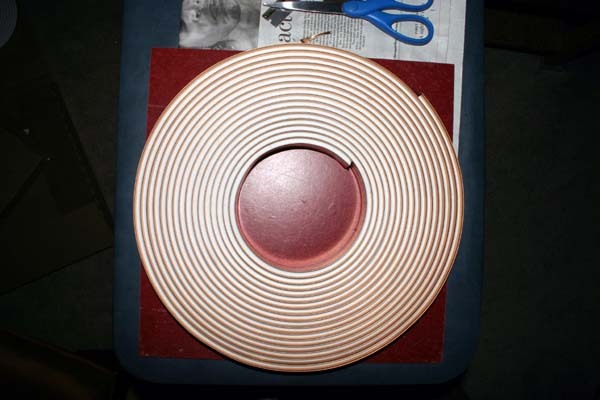 Hands remove some backing and apply foam in center of spring, advance roll, and contain the potential explosion. Done. It took less than 30 minutes. 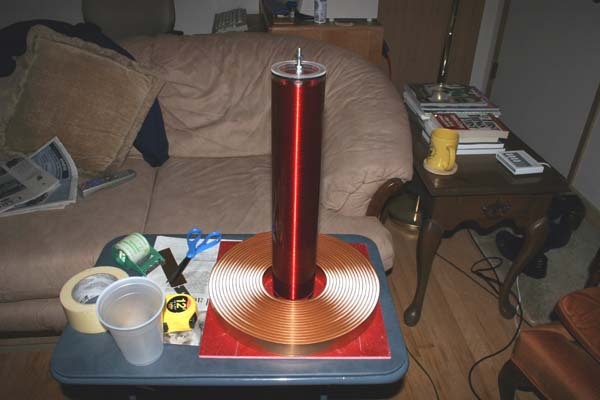 I used the tape measure to check for the desired outside diameter (12"). Did some trimming with regular scissors and a single edge razor blade. The inside turn had to be convinced to stay at 0.25" spacing by manually bending into a smaller diameter and releasing. The outside turn does not get poly-foam applied (last 3.14 feet). 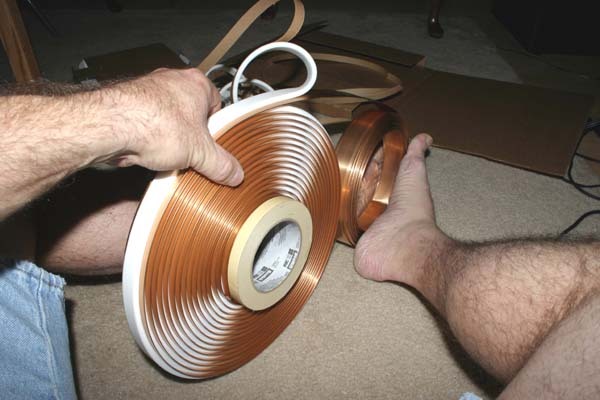 The outside turn is held in place with a thick piece of clear packing tape. Additional work needs to be done to mount and connect to it. But the hard part is done. 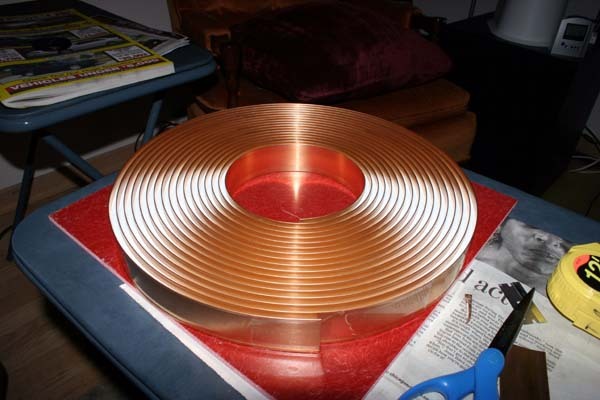 Here is what it looks like with the 3" x 16" oil-filled secondary in place. 1) Have 2 people help you. One holds the spring. One holds and applies the foam. You wind. 2) If you have the space, you could unwind 38 feet of spring, apply the foam, and then wind it up.